One of our top picks in Athens. 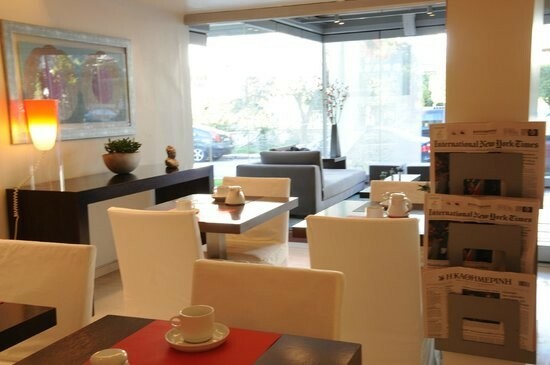 This luxurious hotel is just a short walk from the exclusive shopping district of Glyfada and features contemporary minimalist design. It boasts a swimming pool and a café-restaurant. Each modern suite has been thoughtfully designed in minimalist style to provide a relaxing space throughout your stay. The living area offers plenty of home entertainment options and the marble bathroom is appointed with luxurious amenities and natural products. Hotel Brasil Suites offers a distinct personalised service to its guests and can help you arrange access to the nearby tennis courts and professional golf course. The staff will also ensure your trips and activities are tailor-made to reflect your interests. Glyfada is one of the most exclusive districts of Athens and the golf course and beautiful, sandy beaches are just a short walk away from Hotel Brasil Suites. Athens’ centre is just a 25-minute drive and the international airport is just 30 minutes away. Enjoy our high level transfer services to/from Brasil Suites Hotel Apartments and all over Greece and we promise you the best transfer prices without waiting at airport, port, station and without hidden debits.